Arriving in Chile, you’ll immediately be struck by the open friendliness of the people and their warm hospitality. A land of contrasts, the scenery is just as striking, including everything from dry deserts and awe-inspiring glaciers, to snow-capped volcanoes and lush valleys. Our luxury hotels in Chile offer the ideal base from which to explore this captivating country. Visit vibrant cities and charming villages, and take your time to soak up the laid-back atmosphere. Chile’s stunning simplicity and majestic vistas are bound to leave you wanting more. Immerse yourself in Chilean culture with a visit to the capital Santiago and Valparaiso. Feast on ripe figs and avocados served up by colourful street vendors, before taking a trip to one of Santiago’s fine museums. Follow the artistic impressions of graffiti artists with a walk around Valparaiso’s steep staircases and winding alleyways. When the sun goes down, the traffic eases off - perfect for a nighttime bike ride around the city in the cool evening air. Take the opportunity to watch a performance at Centro Gabriela Mistral, or visit an authentic Chilean neighbourhood such as Lastarria and enjoy some great ethnic cuisine. 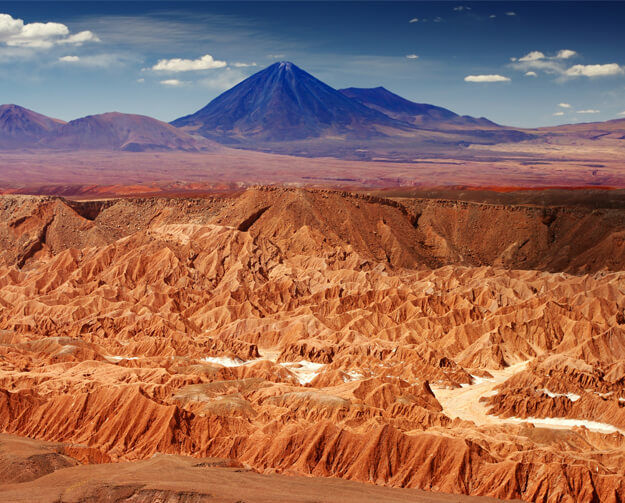 In a country of such outstanding and unspoilt natural beauty, you’ll find yourself bewitched by the red rock canyons of Atacama Desert - said to be the driest place on Earth and a great spot for some star gazing. No trip to Chile is complete without visiting Patagonia and its crowning glory the Parque Nacional Torres del Paine. Said to be South America’s finest national park, this landscape is dominated by the imposing granite pillars of Torres del Paine and is home to verdant forests, rushing rivers and a majestic glacier. Meanwhile, for towering volcanoes and deep blue lakes, look no further than the Lakes District - a natural playground for the adventurous. To make the most of the great outdoors, luxury tours in Chile can be arranged for premier ski resorts, glacier treks, hiking, rafting, kayaking and more. Chile’s wines are renowned across the world, and there’s no better way to sample the best tipples the country has to offer than by travelling to the vineyards that produce them. The famous winelands can be found in the fertile valleys surrounding Santiago. Highlights include the Colchagua Valley, which is located south of the capital and creates superb red vintages, as well as Casablanca Valley, which can be found west of Santiago and offers the ideal climate to produce sauvignon blanc, chardonnay and fruity pinots. Our luxury holidays in Chile can be tailor-made to any itinerary, encapsulating the very best this South American wonderland has to offer. Our handpicked hotels offer sumptuous and stylish accommodation, helping to create holiday memories that will stay with you forever. To find out more about our tours and packages, don’t hesitate to get in touch today. Our helpful and experienced advisors are just a phone call away and will be happy to help you create the ideal holiday itinerary to suit your needs.